It's a snowy 20 degrees fahrenheit in the town of Woodbridge, New Jersey, where Richie Sambora grew up. But the Bon Jovi guitarist is kicking back in California, where Christmas means sunshine and temperatures hovering near 80. "The Garden State will never leave me" says Sambora. "But hey, to be hanging out in the sun at this time of year - c'mon, brother, tell me I'm not the luckiest guy alive." Sambora uses the word 'lucky' often, but then he'll quickly substitute 'fortunate.' It's a safeguard of sorts, a way of reminding himself that his success (and it's massive, too; we're talking 120 Bon Jovi million albums sold worldwide) isn't akin to some guy scratching numbers on a lottery card; it's more the result of, as he puts it, "wishing, wanting and working." 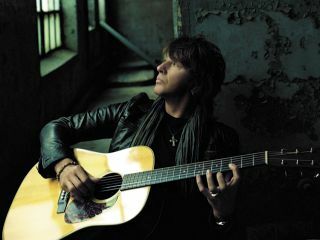 Since he hooked up with John Francis Bongiovi, Jr in 1983, Sambora hasn't been afraid to put in a full day's work, whether it's getting his fingers dirty on the neck of his guitar or burying his head in his hands and trying to conjure up the right title, lyrics or vibe to a catalog of songs that have become increasingly introspective but, surprisingly, more popular than ever. "It's funny," the guitarist laughs. "We used to be lumped in with the '80s hair metal bands - the whole fantasy thing - but the songs of ours that have really resonated with people are the ones they can relate to on a day-to-day level. Songs about doubt, about those times that you hope for wisdom. Face it: if we wrote our 17th version of You Give Love A Bad Name, we'd be over, and rightfully so." Far from over, Bon Jovi just wrapped their biggest year, headlining the highest-grossing tour of 2008 behind their smash album Lost Highway and scoring the first Number 1 single for a rock band on Billboard's Hot Country chart with the song Who Says You Can't Go Home. MusicRadar sat down with Richie Sambora for a very special podcast interview during which he happily answered your questions (all right, there are two of our own). Witty, candid, insightful - it's Richie, off the cuff and totally unscripted.